Today was a day I've been waiting for for a long, long time: brew day. 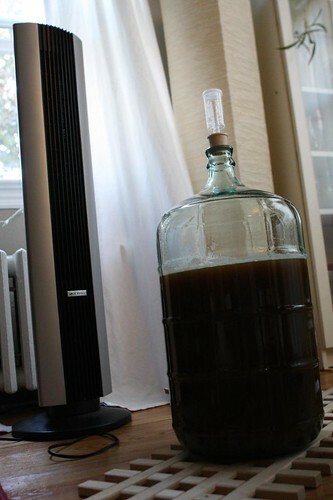 In my normal lazy manner of pursuing my goals I finally got around to beginning my own home brew beer. After well over a decade of wanting to do it, and two months after purchasing all of the gear, I finally started on my own batch of home brew. The day started by unpacking, washing, and sanitizing all of the beer making equipment I'd purchased back in August. This proved to be extremely difficult. Trying to hold a giant, slippery, glass carboy on the edge of a sink while washing it with the extremely short hose sprayer was more difficult than I'd imagined. I took extra care to soak everything in a bleach solution as to hopefully avoid any bacterial infections. Unlike our home canning and jarring experiments I was less on edge knowing that the worst outcome of bad brewing would be a bad-tasting beer. That beats death by botulism any day. 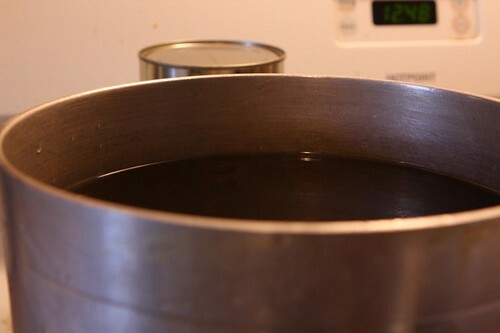 After putting the 1.5 gallons of water into my largest stock pot it became quite obvious that there really wasn't going to be any chance I could fit anything else into the pot. I put everything on hold, ran out to the local beer shop, and picked up an incredibly poor quality pot that seemed to just one gauge thicker than standard kitchen aluminum foil. It was, however, big enough for everything and fairly cheap. Soon the smell of breakfast porridge (or cream of wheat) filled the kitchen. 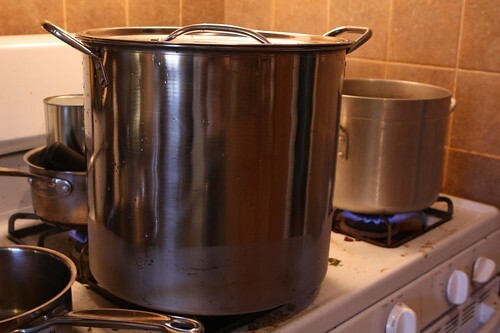 I watched the pot like a hawk, expecting it to foam up and boil over. This was about as bad as it got. Everything I read, everything I've seen, lead me to believe that this boil up would be the worst thing I'd ever encountered. It was nothing compared to scorching milk or making caramel sauce. I was disappointed. 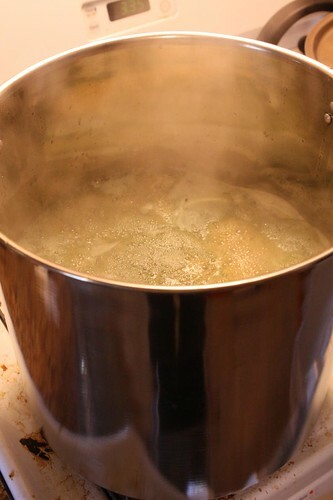 I feel like I was cheated out of an overflowing pot and smoke-filled kitchen as part of the brewing process. Either my culinary skills came in handy or I was doing something wrong. It's probably the latter. 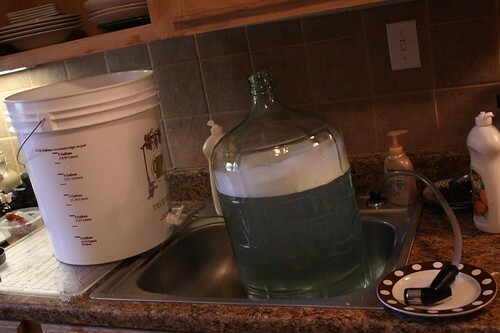 After a lot more boiling, adding hops, boiling, adding sugar, funneling, adding cold water, chilling, adding yeast, waiting, mixing, waiting, and finally sealing the carboy up my brew day had come to a close. I had to chill it in front of a fan by the window for a while until it was at a low enough temperature to throw the yeast in. 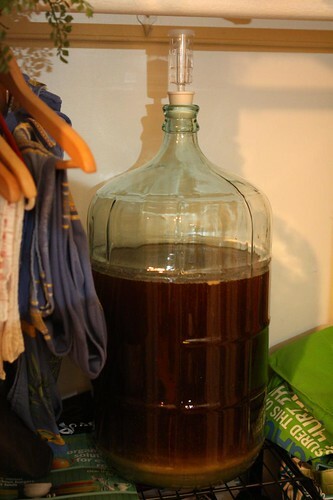 I set the carboy full of wort into a dark closet where I would allow it to ferment for the next few days. After doing all of this I have a new found appreciation for people who don't know how to cook. It must feel a lot like this. Having never done this before it was a scary and confusing process. I didn't understand some of the directions and wasn't sure if I was doing it properly. I was reading and re-reading steps in the instructions a half dozen times. There were times where I was just looking at all the ingredients and equipment unsure of where to start. I'm sure I took far too many precautions and I had to search message boards for really dumb questions I kept having. I look forward to a few batches from now where I'm just winging it like I do when I made dinner every night. That will be a glorious day. After adding the yeast it was almost 7:00 PM so I had to put something together quickly for dinner. I cooked a little crushed garlic in olive oil with onion, red chilies (I was feeling brave), celery root, red potato, and pumpkin. I added salt, pepper, sage, thyme, and a ladle full of the turkey stock I'd made the other day. When that had cooked down I put in some ground lamb from Pineland Farms in New Gloucester, Maine. I don't know why but this felt very Iron Chef inspired to me. 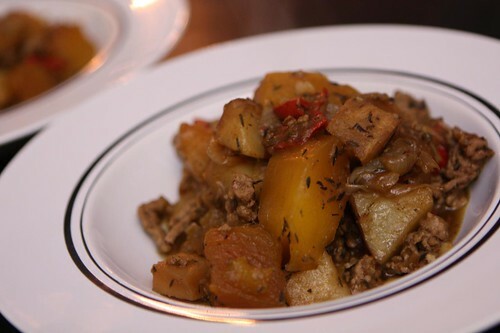 It's probably because it was such a small amount of lamb that it felt very Chen Kenichi to use ground lamb as an ingredient in a pumpkin-centric dish rather than as the main ingredient. After dinner, to celebrate my first brew day, I cracked open this bottle of Chateau Jihau from Dogfish Head. 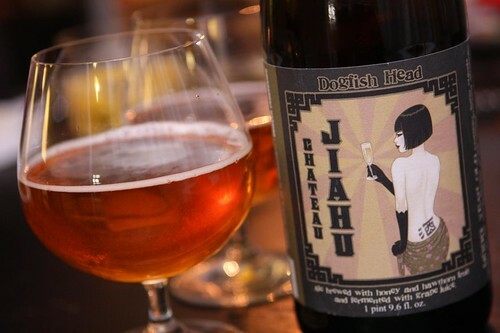 This beer is part of Dogfish Head's "Ancient Ales" series and is based on a recipe developed in conjunction with Molecular Archaeologist Dr. Patrick McGovern. The recipe was discovered by examining preserved pottery jars found in the Neolithic village of Jiahu. The recipe called or fermentation of rice along with honey and fruit. I chose this beer for a few reasons. One: we'd been watching some episodes of Brew Masters (or as I like to call it, Bro Masters) over the last few nights. Two: this claims to be the oldest beer recipe in the world (over 9,000 years old) so I thought it fitting to drink Earth's first beer recipe with my first attempt at brewing. Hopefully mine is half as palatable. To conclude the evening we enjoyed the Chateau Jiahu while watching the thematically appropriate Prohibition, a documentary by Ken Burns. There's nothing better than watching a documentary about one of our nation's most embarrassing episodes. This particular beer enhanced the embarrassment knowing that a Neolithic village in Northern China had more sense than the most advanced civilization in the world 9,000 years later. Oh, America, do you ever stop coming up with really bad ideas?